The finish basement is always an extra space that completes your life style. 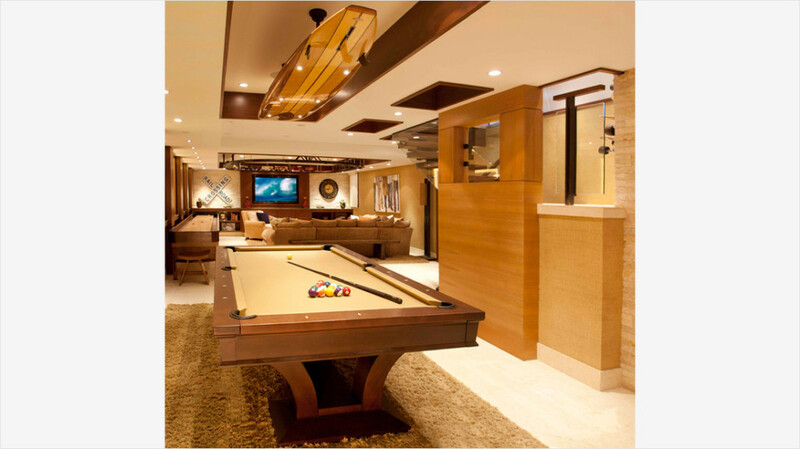 Amusing Man: Basement with Pool Table Ideas is the first article of basement remodeling category. The basement can serve many purposes and basement remodeling is very dynamic. The changing demands of your life spam establish the stages of your basement. A standard basement serving stages are like storage room, office, toy room, home school room, guest room, man cave, entertaining center, party room, craft room, library. You may add your idea to make a longer chain for basement remodeling ideas. I would like to dedicate Amusing Man: Basement with Pool Table Ideas to all fathers. To all loving, caring, super hero role model Fathers, who love to make happy the all family. Happy Father’s Day. The pictures that I would love to share with you have been meticulously picked for your review in Basement with Pool Table Ideas. Picture Credit: About: Space, LLC., and photographer is Nicole Leone., Very relaxing atmosphere and very unique ideas. Surf board lighting fixture rocks. Picture Credit: Designed by Donahoe Group and picture is taken by Tom Watson. I think the flooring , pendant, wall art, and sliding door beside the pool table have feeling. Cool looking basement. Picture Credit: John Kraemer & Sons., Simple is the best. Granite shelf in front of the big mirror seems very unique. Picture Credit: CHC Creative Remodeling via Houzz., All in one. Like an amusement park . Picture Credit: Nor-Son, Inc., Classic and elegant. Please share this article with your Father as a Father’s Day Gift, and please drop the comments without the hesitation.